Storm clouds and rain drops may have kept the classic cars home, but a little bad weather wasn't enough to stop the Neighborhood Cruisers from pouring a little sunshine on three local families lives. Even Sugrue, an eight year old from Pomona, was diagnosed with Cerebral Palsy when he was just fifteen months old. 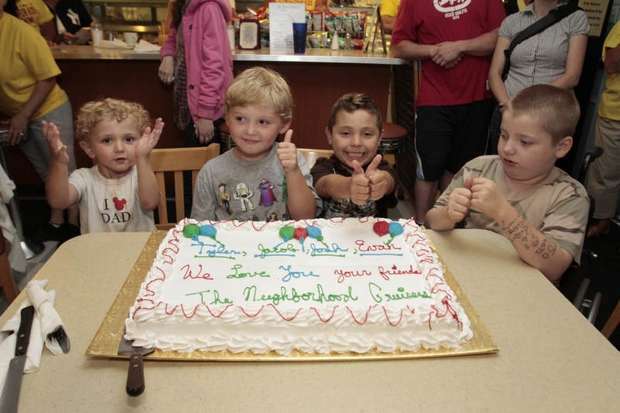 Brothers Jacob and Joshua Czaikowski, seven and four year olds from Nanuet, have had disabilities from their infancy. They suffered through ongoing seizures, a brain bleed, blood issues and a stroke. Josh, in addition, has a low form of spinal bifida. Tyler Tobin, a six year old from Orangeburg, was discovered to have Paroxysmal Nocturnal Hemoglobinuria. PNH is an acquired mutation that causes some or all of your body’s red blood cells to be destroyed by a process called hemolysis. Tyler underwent a bone marrow transplant and with lifelong medical observation there is hope Tyler has an opportunity to have a “normal” life. 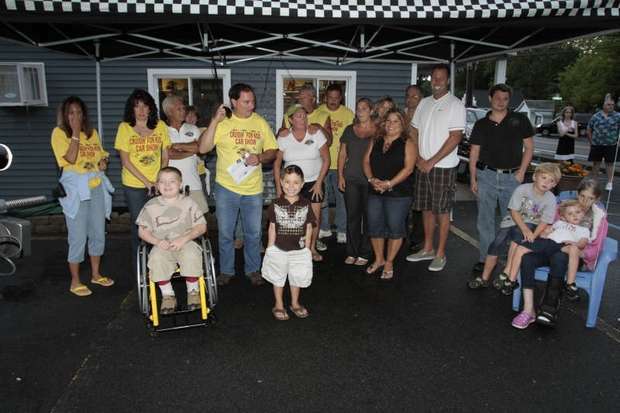 Thanks to money raised through their annual car show, Cruisin for Kids, the Neighborhood Cruisers (a non profit car club from Stony Point, NY) were able to present three families with checks for $7,000 to help alleviate the financial burdens that come with having a child with special needs. After the checks were handed out and the cake was served one of the families quieted the room; Bill Tobin (Tyler's father) wanted to make a speech. What he said next surprised the entire room and shocked the club members. Bill and Krissy Tobin remarked at the overwhelming generosity and support they've received from the community during Tyler's illness. The Tobin's asked that their portion of the proceeds be given back to the club and split amongst the Sugrues and the Czaikowskis. To see photos from the event click here.